I attended the finale night of Dallas Fashion Week 2012 and I must say I had a fabulous time. I attended three days of the events and I had the best time, so note that for next year. Tonight's event included a Red Ball Aids Awareness Benefit & Award Gala at the magnificent Texas Museum of Automotive History, hence the cars in the background. Now for the outfit at hand. Wearing a tulle skirt is something that I never I enter into lightly. The thought about wearing a tulle skirt at the ripe old age of 31 had me doubting my ability to pull it off. It's a tricky thing to pull off without trying to look too costumey or like I'm 12 (seeing as I just bought my niece one for Christmas). I jumped into the challenge. I figured to approach the skirt in the most sophisticated way possible and this is the outfit I came up with. There was also awesome networking at the event. I must shout out an avid reader, Adrienne, that I met at the Gala. She was so excited about my blog and even though she is not plus size anymore, (she lost 80 pounds) she still is a reader. I'm a regular girl who happens to record her life and style in a blog and it still amazes me that people are genuinely excited to meet "little ole me." It was so humbling to met her and she was super sweet. Briefly, I wanted to share the next event that I'll be attending in Dallas. It's called Girls Bite Out and it's a dinner party with a purpose. All the proceeds go to the North Texas Food Bank. For more info click here. Love this look!!!! And I like the skirt!!! That blouse is hott!!! I love this!!! I wouldn't have anywhere to go in a skirt like that. But, you make me want one anyway! That outfit is bangin'! I can't even be made at you for any of this ensemble! Once again, I pinned it on Pinterest! I always hear people say that they don't see cute plus sized bloggers giving it to em...Babyyyyyyyy Crunch! And that is probably the best comment I have received all year. LMAO!!!! I'M DONE!!! You sure should have! I would loved to meet you. Tweet me! Following and adding you to my blogroll this minute. 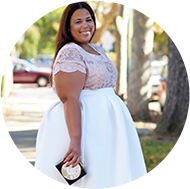 You made the tulle skirt look soooo sophisticated! Amazing look. I am going to have to buy this adorable skirt! The lace to you're wearing is to die for!!! That shirt is amazing! and love your friends metallic skirt also its gorgeous! I want to try this with my tulle skirt! And I would have never believed that you were 31! WOW YOU ARE very beautiful !! I LOVE this look...just way too cute! I need to find that skirt!